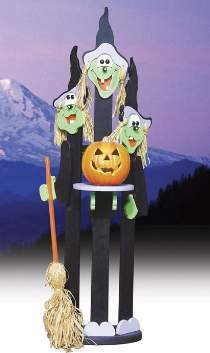 Three witches join together to hold your Halloween pumpkin. The witches bodies are cut from fence pickets or "1x4" pine boards. Noses are lit with green light bulbs. Tallest witch stands 66" tall. All patterns drawn FULL SIZE on three large pattern sheets. #9895 Picket Witches Hardware contains a three-socket wiring harness, three green bulbs, six plastic eyes and raffia straw for witches' hair and broom. Project plan, wood and paint are not included. Order hardware separately or see #1685 Special Offer which includes the hardware and plan together.